Made from cold cast resin and standing 10.5 inches tall, this Columbia Calls Statue represents the poetic and feminine personification of the United States of America. This miniature U.S. Civil War cannon is typical of the field cannons used by both sides in the conflict. At 7.25 inches long, this piece is part of a series of famous cannon miniatures from Denix made in Spain. The Civil War cannon is ideal for wargamers or Civil War collectors. The Civil War cannon has authentic detailing and historically accurate. 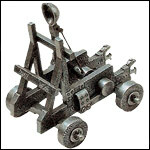 Our Miniature Medieval Catapult from Denix is a detailed replica of a medieval machine. Catapults existed since Roman times, and though this miniature from Denix replicates an 11th century piece the design had changed little over the intervening period. Our mini catapult makes a great gift, desk accessory or toy for the history buff. The Musketeer Rapier Letter Openers are fine miniatures of the larger swords produced by Art Gladius. Our Ma Deuce 50 Cal Machine Gun Miniature is a Desktop Replica of the famous Ma Deuce .50 caliber machine gun that was widely used by US forces from World War two through the Viet Nam War. Our Deluxe Masonic Letter Opener by Marto is inspired with the symbolism of the popular esoteric Brotherhood. The Freemasonry Masonic Sword letter opener by Marto of Toledo Spain has a steel blade. Our King Charles III Rapier Letter Opener by Marto is a replica reproduction of a guard sword that belonged to King Charles III. Our Genghis Khan Letter Opener by Marto celebrates Genghis Khan, the founder, Khan (ruler) and Khagan (emperor) of the Mongol Empire, the largest contiguous empire in history. Our Great Captain Letter Opener by Marto honors the story of Gonzalo Ferdinaz de Cordoba, a great military leader in the time of the Catholic Kings (15th and 16th centuries). Our "Highlander" Dragon Samurai Katana Letter Opener by Marto is the Marto collection version of the Official Dragon Head Katana Sword used in the Highlander movies, and officially licensed by Marto. Our King Richard the Lionheart Letter Opener by Marto honors the celebrated second Plantagenet king of England, born September 8, 1157 and ascended the throne of England on July 6, 1189, ruling until his death 1199. Our King Solomon Letter Opener by Marto celebrates the legendary King of Israel from 970 and 931 B.C.E. Our Lafayette Letter Opener by Marto honors Marquis de La Fayette (or Lafayette) (6 September 1757 – 20 May 1834), a French military officer born in the province of Auvergne in south central France. Our Masonic Letter Opener by Marto is inspired with the symbolism of the popular esoteric Brotherhood, born officially in western Europe between the late 17th and the early 18th centuries. Our Odin Fantasy Letter Opener Gold - Silver - Bronze by Marto is a Miniature fantasy reproduction of the Odin sword by Marto of Toledo Spain. Our Renaissance Rapier Letter Opener by Marto is a reproduction of a typical 16th century Renaissance period rapier fencing sword featuring a swept hilt fit to protect the hand from the point of the enemy's sword. Our Robin Hood Medieval Letter Opener by Marto heralds the most popular legendary story, dating back the life of Robin Hood of Locksley, the most famous outlaw of all times. Our Roldan Medieval Letter Opener by Marto is a replica of the sword of Charlemagne's paladin Roland (Roldan). Our Roman Julius Ceasar Letter Opener by Marto is a replica of the sword of Julius Caesar (101 BC - 44 BC), the greatest military and political leader of ancient Rome. Our Odin Fantasy Letter Opener by Marto is a fantasy reproduction of a sword for the chief god of the Viking Norsemen. This beautiful Miniature Damascene Excalibur Sword Letter Opener is manufactured in Toledo Spain by the famous Midas factory of the Marto swordsmiths. Our King Richard the Lionheart Letter Opener by Marto honors the celebrated ;second Plantagenet king of England, born September 8, 1157 and ascended the throne of England on July 6, 1189, ruling until his death April 6, 1199. Our Miniature M1873 Single Action Revolver is a six shooter revolver with all the details of our full size non firing replicas. It has an antiqued gray finish, and a simulated wood handle. The action works just like the original. Made from cold cast resin and standing 12 inches tall, this WWII Sailor and Nurse figurine recreates the iconic kiss on V-J day in Times Square. Our Saint Ferdinand III Letter Opener by Marto honors the King of Castile from 1217 and King of León from 1230. Our Sir Francis Drake Letter Opener by Marto honors Sir Francis Drake, Vice Admiral, was an English sea captain, privateer, navigator, slaver and politician of the Elizabethan era. Our Spanish Tizona Cup Hilt Rapier Letter Opener by Marto is a reproduction replica of the very well known sword from the 16th century. Our Templar Knight Letter Opener by Marto is a replica of those used in the 13th century.The knights Templar considered themselves as the knights of God, honor of the church and Christianity. Our Templar Letter Opener by Marto is a replica of those used in the 13th century.The knights Templar considered themselves as the knights of God, honor of the church and Christianity. Our Three Musketeers Rapier Letter Opener by Marto celebrates the special corp of "The Musketeers", established by King Luis XIII of France in 1622. Our Tizona Letter Opener by Marto honors Castilian knight Rodrigo Diaz de Vivar. Our Toledo Medieval Letter Opener by Marto features the Toledo city crest. Our Viking Letter Opener by Marto is a symbol of the weapon most popular among Vikings and was considered with great respect. Our Catholic Kings Letter Opener by Marto is one of the most spectacular swords in Spanish History. With this sword, the Catholic Monarchs Ferdinand and Isabella, knighted Christopher Columbus on his return from his first voyage to America. Meticulous research has gone into this beautiful and epic miniature sword letter opener associated to one of the most well known military Orders of all time, The Knights Templar. The stand includes an enameled shield adorned with the coat-of-arms of the Templars on both sides, allowing the piece to be displayed in either direction.